ROF’s call center cubicles for sale are built to the strictest specifications and with the finest materials, as we deal exclusively with reputable office workstation brands. 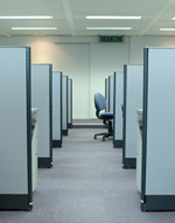 Further, our experienced and skilled remanufacturers can bring your refurbished call center cubicles back to like-new condition. Save money without sacrificing quality and lasting integrity with call center cubicles, workstation furniture, modular system furniture, cubicle furniture, and other panel systems from ROF Furniture.